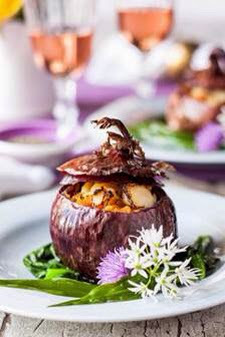 Swing your taste buds into summer with this unique recipe for a crispy baked onion filled with creamy sweet potato and smoked haddock, topped off with cheese. Simple fresh flavours shine through and create a dish which will add sophistication to any dinner table. Created by celebrity chef and sweet potato lover, Felice Tocchini of Fusion Brasserie in Worcester, this Sweet Potato & Smoked Haddock in an Onion recipe is delicious served up as a starter with a leafy salad, or as a main accompanied with fresh vegetables. For an elegant twist, garnish the plate with hand-picked flowers! The Love Sweet Potatoes campaign is designed to tell consumers about the benefits of eating sweet potatoes and all the different ways they can be used. The North Carolina farming family at Scott Farms is behind the campaign and has been growing sweet potatoes for over four generations. They are now the largest importer of sweet potatoes into the UK. 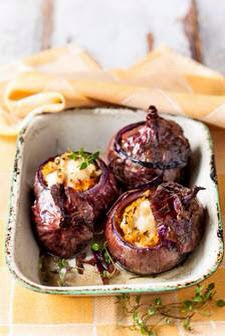 With barbecue season just around the corner, this stuffed onion will make a great accompaniment to the perfect flame grilled steak, so why not give it a try and let me know how you get on.